Thank you to Claudio Enriquez from Two Boys and a Dad-Teacher for his guest post today! Read closely to determine what the text says explicitly and to make logical inferences from it; cite specific textual evidence when writing or speaking to support conclusions drawn from text. That’s a mouthful! But what does this look like for our students, and what does it mean instructionally for the teacher? Back in the day, inference was a separate standard in the old California ELA Standards. You could count on an inference multiple choice question on the state test. Now, it is embedded in every literature and informational standard that we teach. Students are to have a basic level of comprehension of the text (determine what the text says explicitly) but then to go beyond the text and infer. Infer about character motivations, infer about settings, infer about central message, infer about point of view, infer about EVERYTHING. 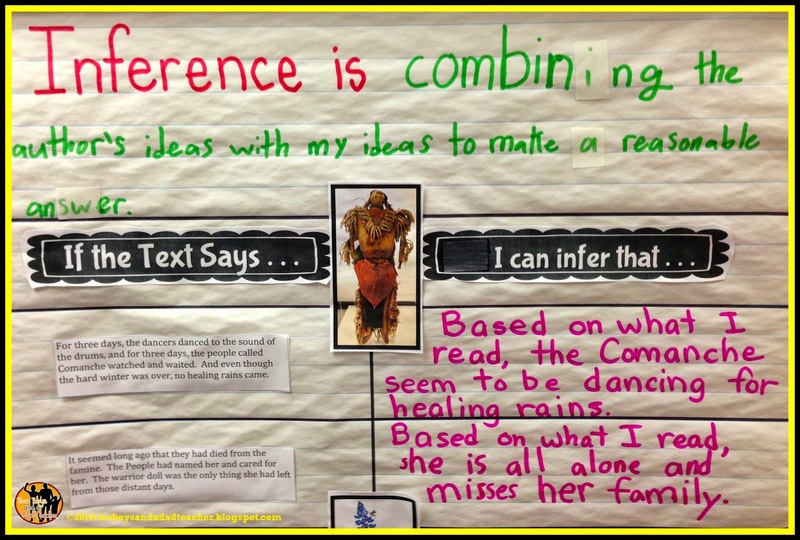 Students are now expected to infer continuously and on their own. 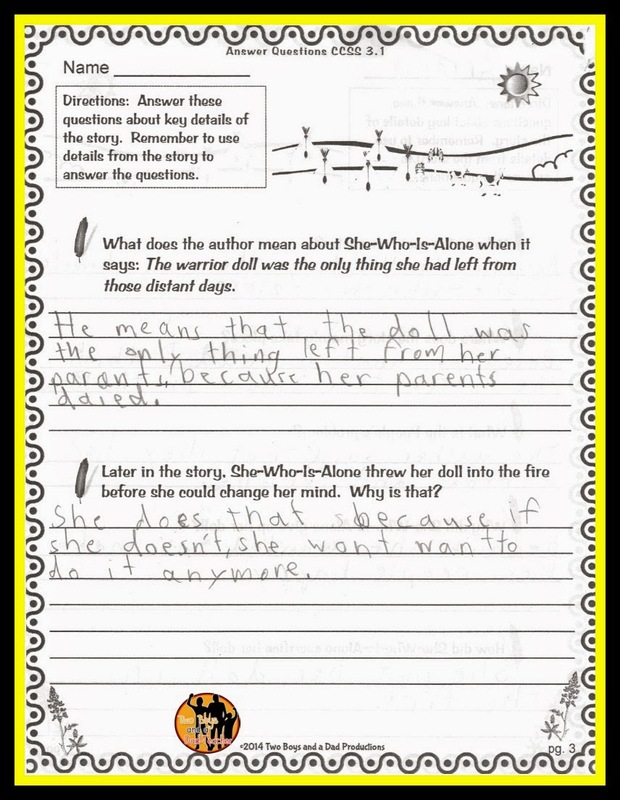 Most teachers explain inference to their students as using the information the author has given you and combining that with your own schema to produce a reasonable answer. But how can we as teachers give students ample opportunities to practice inferring on a daily or extended basis so that it becomes habit? Why did the horses decide to spend the morning at the beach? Based on the photo of the horses laying on the beach, the horses decided to spend the day there because the sand is warm and soft and fun to roll around in. These are another fun way to get students to use clues or text evidence to infer. My students enjoy using this web-based riddle site to figure out the daily riddle. The daily riddle also offers a “give a clue” feature if you are stuck. Once the answer has been figured out, discuss how the clues lead to that answer. Dissecting a riddle can show students explicitly how to use the author’s text and your own schema to make a reasonable guess. Little Red Riding Hood is a girl. Little Red Riding Hood is about 8 years old. Little Red Riding Hood talked to the wolf. Little Red Riding Hood was not aware of the wolf’s plan to eat her. The setting of the story is the forest or woods. The forest may have been full of other frightening or dangerous animals. Little Red’s grandmother was sick in bed. Little Red’s grandmother may be sick with a cold or flu. Little Red’s hood was red in color. Little Red’s hood was red because it could have been her favorite color. Arrange the sentence strips in a mixed up order and work with students to sort them by fact and inference. Emphasize with students that the facts can be easily found using the text or the illustrations, while the inferences are not mentioned in the text or the illustrations directly but can be inferred from available clues in the text or the illustrations. This can be a quick 5-minute activity or made into a full complete lesson. I have made some cards with character traits and character portraits (you might actually have to teach the words first because, in my experience, many children—especially ELLs—do not know the meaning of words such as generous, superstitious, optimistic, rebellious, etc.). You can make your own cards on simple index cards. First, I introduce a character that is well known to them, such as Greg Hefley, aka the Wimpy Kid. Then we talk about what he is like as a person: his thoughts, feelings, actions, what others think of him, etc. Then I bring out the character trait cards and we discuss which thoughts, feelings, actions, etc. might be one of these character traits. Even though the author did not explicitly describe the Wimpy Kid as being optimistic, we agreed that he was because he believed that in the new school year things were going to go great, and he would be more popular. Students also felt that when they started the new school year, they also felt optimistic that it would be a great year. 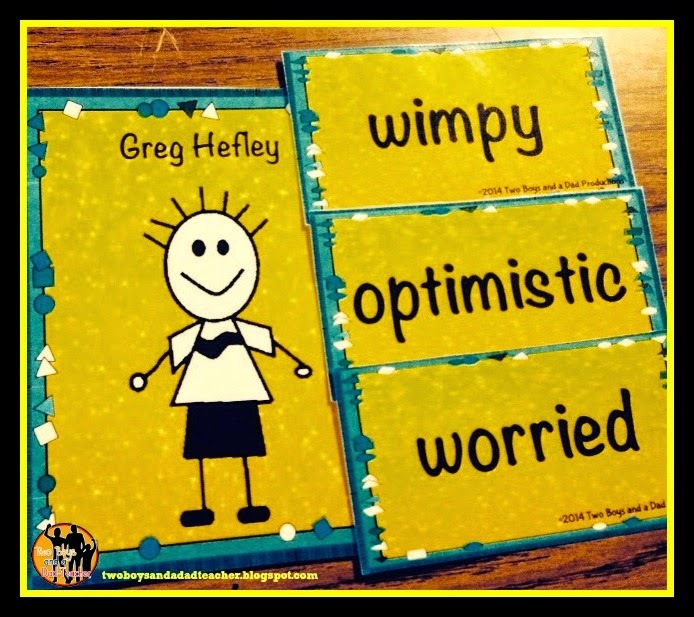 An example of the trait cards and character portrait shows that the Wimpy Kid is wimpy, optimistic, and worried. This activity can be a daily activity that can take 5-10 minutes or can be an extended lesson as part of character analysis. Now comes the true test of inference. 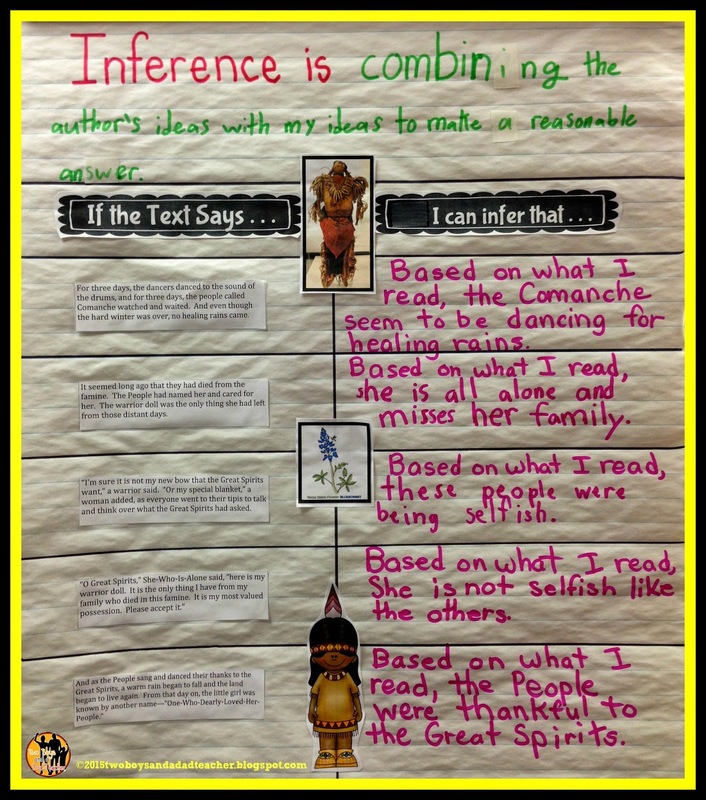 Are students ready to infer directly from a text? In my class we are currently on our Folktales Unit. I have been using Gerald McDermott’s folktales Raven, Arrow to the Sun, and Coyote. I’ve also been using Tomie DePaola’s folktales The Legend of the Indian Paintbrush and The Legend of the Bluebonnet. For the latter I developed this chart, which takes text directly out of the story, The Legend of the Bluebonnet, and then asks for an inference. Before actually working on this chart, I must add that the students were very familiar with the story beforehand. I had read it out loud as they wrote down questions they had. I had given each student a copy of the entire text for a close reading. We answered explicit questions about the text, as well as retelling the text and discussing the central message. All this was part of the unit using my Legend of the Bluebonnet Third Grade Companion Pack. I have shared a free sample of this pack HERE. So now it was time to reflect back on the text and draw inferences. The chart was done interactively using Interactive Writing. Together as a class, we negotiated the definition of inference. Then I read aloud a text excerpt I had on the chart. Together we shared inferences that could be made from that text. We used the sentence starter “based on what I read” for each inference made. For each inference we discussed whether that inference could be made from the text evidence or if it was just a wild guess. From there I had developed text-dependent inference questions that the students would then answer on their own to show if they could, or I determined whether I would have to reteach and/or continue to reinforce. Most of the students were successful in making an inference. 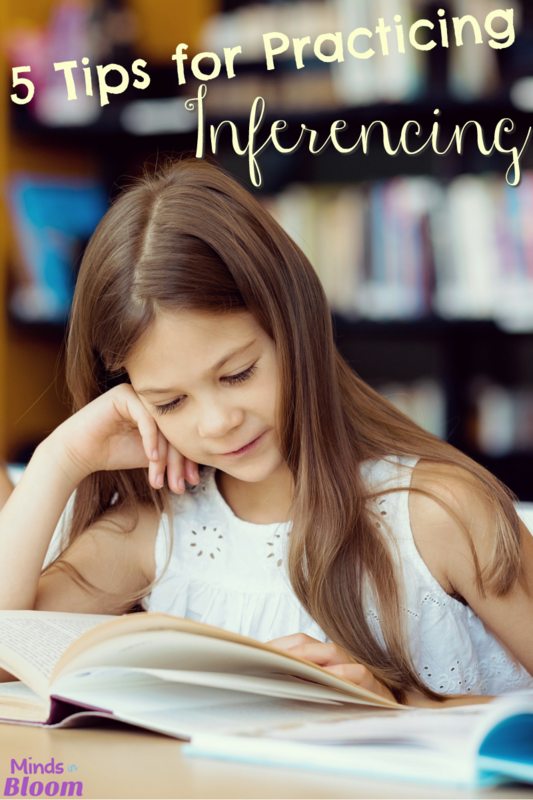 But, I know that it will take continued practice for the students to continue making inferences ON THEIR OWN continuously when reading without my prompting. I am currently in my 30th year of teaching, most of that in third grade. I’m also a single dad raising two boys who are in elementary school. Come read more about my classroom at my blog Two Boys and a Dad-Teacher. You can also follow me on Pinterest, Instagram or my TpT store. I love when kids hone their higher-level thinking skills, especially inference. Great tips here for how to be a detective, see clues, think deeply…and live better.